The Progress in Applied Mathematics believes strongly, however, that unrestricted public access to research findings is a crucial part of upholding the values of the Progress in Applied Mathematics. Open access allows for broader dissemination of knowledge and ultimately promotes research advancement, crucial to the Progress in Applied Mathematics' mission. 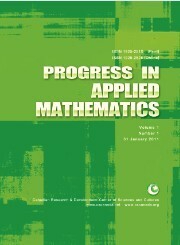 Progress in Applied Mathematics is an international mathematical journal, which is devoted to report the latest progress on all aspects of applied mathematics. The journal aims to provide a high-level forum for all applied mathematicians, computer scientists, physicists, statisticians, analysts, biologists and engineers over the world. The journal features articles on mathematical physics, statistics, mathematical biology, dynamical systems, financial mathematics, optimization, algorithms, numeric analysis, symbolic computation, etc. 1. The manuscripts are required to be written in English, and they should be submitted to pam@cscanada.net or pam@cscanada.org. The preferred format is MSWord. 2. We will send you a confirming E-mail in two days after receiving your article. Please contact us if the E-mail is not timely delivered. 3. The review process is about 14-60 days. We will immediately send you the reviewers’ comments by an E-mail. Please contact us if you haven`t got any information in two months. 4. You will receive on free sample of the issue that contains your article. Please contact us if you haven`t received it in a month. 5. The copyright of the articles goes to the authors, while PAM owns the first publishing right. 6. As for the publication fees, 50% of the articles are free, on the basis of assessment results given by our editorial team. Excellent articles will be published with no charge, but others will not. If you have already registered in Journal A and plan to submit article(s) to Journal B, please click the "CATEGORIES", or "JOURNALS A-Z" on the right side of the "HOME". Articles published in Progress in Applied Mathematics are licensed under Creative Commons Attribution 4.0 (CC-BY).